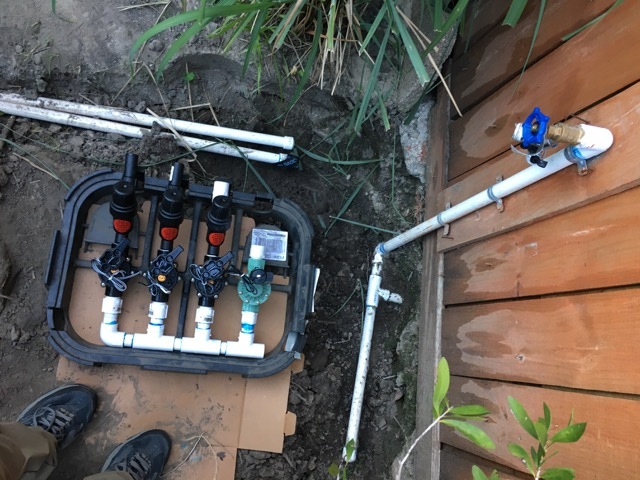 Long story short I am getting ready to install my backflow preventer on my DIY irrigation system. The main water supply is the pipe coming out from under the storage shed. It tees off to the left for the water hose bib and the irrigation is on the right. The other two PVC pipes on the left of the pictures are coming from the yard irrigation. My question is do I need to lower the hose bib/spigot so that it is below the backflow preventer? And also is my mockup of everything in the second picture a good plan? It looks like three of those valves are for drip lines, yes? I recommend you get valves with flow controls. Sometimes drip valves have a hard time turning off because of the low flow and turning down the flow control helps a lot. You can either change it now or wait and see what happens. If you need flow controls you can always just swap out the bonnets from new valves. I just figure if you do it now you can return the valves. And that faucet. Maybe just buy one of those hose bib backflow devices that screws right onto the bib. Thank you for the response. Yes three valves are for drip irrigation zones. The valves are https://www.amazon.com/gp/product/B00466X8TO/ref=oh_aui_detailpage_o03_s00?ie=UTF8&psc=1 and my understanding is that I can adjust the flow with the built in pressure regulator. It clearly says those valves are for drip. Give it a go. Thank you for the response. So my plan now is just to go ahead and move the spigot/hose bib to the pipe coming out of the backflow preventer. I think I'll be happier in the long run with it set up that way. I hope to get most of it all together today! By code (at least where I am at), the spigot needs to be AFTER the PVB. So it would need to go on the downleg. However I definitely want it done right so I guess I will go ahead and move the spigot to the down leg. 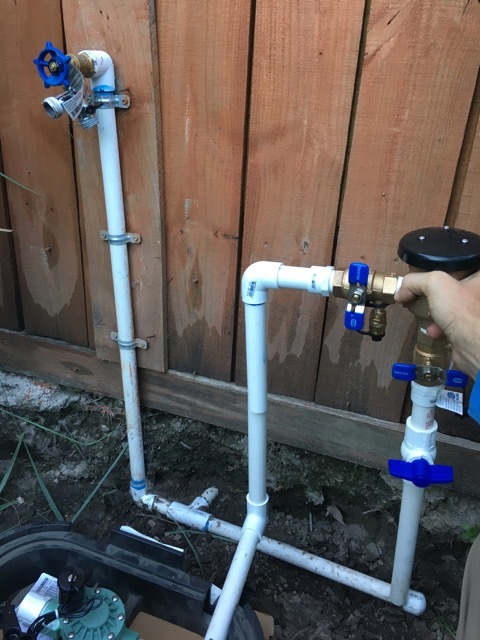 The plumbing configuration in the photo would be acceptable even with elevation questions, because the hose bib is upstream of the PVB, and not part of the sprinkler system. It is the plumbing downstream of a PVB that must comply with elevation requirements. And yes, go ahead an install a hose-bib vacuum breaker. 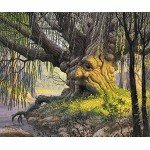 Thank you for the responses. I got sidetracked but hopefully I will get back to working on it. If I go ahead and move the spigot to the downleg of the backflow then I'll make sure it's 12 inches below the backflow. If you change the hose bib location to downstream of the PVB, then you don't need to install a vacuum breaker attachment on it.